It seems that no matter how many yachts we report as sold, there are still more coming onto the market, the latest being Oceanco's 51.4m motor yacht Lazy Z, now for sale with Merle Wood and Peter Croke at Merle Wood & Associates. Delivered in 1997, she had an extensive refit in 2007 and an exterior paint job in 2008. Lloyds classed and MCA compliant, Lazy Z sleeps 12 guests in a two level master suite plus five other staterooms and carries up to 12 crew in six cabins. 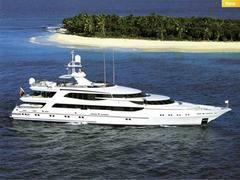 Currently in the Caribbean, Lazy Z is on the market at $27 million.